Can we invite you to virtual tour through our stud? You are welcome here in the beautiful Uckermark – roughly 80 km nordeast of Berlin. Gorlsdorf Stud is located right in the middle of the Biosphere Reserve Schorfheide-Chorin between the historic recreation resort Angermunde and the town of Templin, the home of German chancellor Angela Merkel. Gorlsdorf is among the oldest and biggest thoroughbred studs in Germany. Founded in 1883 the stud can look back on a rich and moving history including two World Wars and their dictatorships. But throughout the years between the German Empire and today Gorlsdorf always has been a successful stud for horses of the race English Thoroughbreds. Despite the fact that Gorlsdorf had his first Derby winner in 1895 thanks to IMPULS (Fulmen out of Comtesse Caroline), the canter win in the Derby 2011 by SEA THE MOON must be the highlight so far in the 135 year long history of the stud. Gorlsdorf still holds the majority of the son of SEA THE STARS and is covering since 2015 in the famous Lanwades Stud near the English horse racing Mecca Newmarket. And this despite the fact that right after German unification the future did not look too bright for the then state owned stud which after all produced eight GDR Derby winners – including the foundation mare of the most successful Meer-Line, MEERNYMPHE. The state wanted to sell the horses as quickly as possible and get rid of the agricultural operation. The entrepreneur Dr. Hinrich Bischoff (Germania Airlines) of Berlin took the stud over from the German Treuhand with the commitment to maintain the breeding of thoroughbreds. And he did not do just that: He invested millions to restore the historic buildings and renovate the equipment. This is why Gorlsdorf is today a paradise for German thoroughbred horses. After the death of her father Heike Bischoff-Lafrentz took over as leader of the stud and later bought the firm and land from her coheirs. She also made sustainable investments but this time into the herd of brooding mares. Among the top buys was the MONSUN-daughter SANWA, mother of the Derby winner SEA THE MOON, but also the Monjeu-daughter FAVORITE, who produced a Listed winner in England: FUN MAC (Shirocco) who was also place in a Group I. 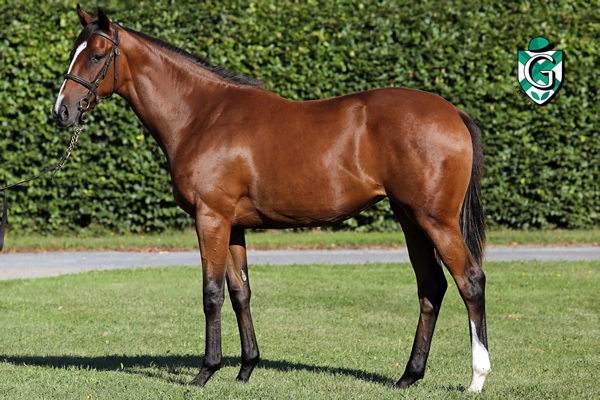 Her first SEA THE MOON-Son was sold at the BBAG yearling sales for 460.00 Euro to the ruler of Dubai, Sheik Mohammed. The sales highlight in 2017 however was the Sea The Moon son out of the newly bought TICKLE ME PINK (Groom Dancer). He was sold at Tattersalls in Newmarket for 525.000 Guineas (615.000 Euro). He is the most expensive German bred thoroughbred yearling of his year. But It was not just the newly added mares who were successful. It also paid off that the new owners took care of the traditional Gorlsdorf breeding lines like the already mentioned Meer-line. The horses thanked by producing champions and Group winners like BORN TO RUN (Two year champion in Germany 2013), MEERJUNGFRAU (Schwarzgold-Rennen) and MEERGÖRL (Diana Trial, Hoppegarten), HEY LITTLE GÖRL (Champion 3jährige Steherin, St. Leger), MATCHWINNER (Preis der Deutschen Einheit) und WUNDER (Prix Chloe). There are about 50 brooding mares grazing on the paddocks of the 124 hectare big stud in the Uckermark. But not all of them are being covered every year. In particular the mares with foals on their side get a break every now and then, so that they don’t have to travel with their offspring to stallions in Ireland, England or France. Another principle: Aging mares don’t get sold but get a place in the so called Görlsdorf Seniors Paddock! But judge for yourself: We are trying to tell you as much as possible about Görlsdorf on our website. You will find plenty of pictures, current news and press reviews, portraits about our brooding mares, their foals and yearlings and our racing stable. Have fun surfing our virtual tour of the stud!